The trip to Old Trafford is one of the shortest away journeys in football for the Liverpool supporters. No early starts and no early nights the day before. Which makes it even more surprising that the Liverpool players failed to turn up against the Premiership leaders. Despite the protestations of refereeing decisions, Liverpool were half-asleep and still in their pyjamas for most of the game. From the outset Liverpool looked like they were the proverbial rabbit in the headlights – playing deep in their own half and leaving Liverpool fans wondering if the past 7 games of supreme form had all been one long dream. Bad results can occasionally be accepted in football, but when big players fail to turn up for big games, they make a mockery of the traditions of our club. United, seemingly, wanted it more. When Mascherano entered the referee’s notebook in the 11th minute you could sense something was going to happen. 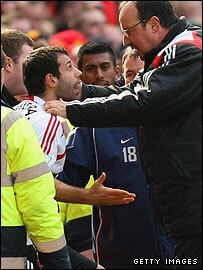 His offence was a silly challenge on Scholes – no doubt brought on by the alarming start produced by his fellow players. Reina was having a topsy turvy game. Producing a couple of fine saves as United started with a barrage. 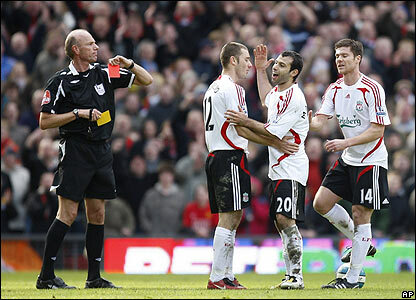 Rooney elected to stay on his feet when Carragher nearly gave away his millionth penalty of the season. Reina denied him. Liverpool’s defence, which has been formidable, was now terrible. Rooney swung in a cross which Skrtel didn’t fancy heading away. Wes Brown, or to be more precise his back, was there to freakishly send the ball over the advancing Pepe Reina. 1-0 down. Within 10 minutes, Torres had got his name pencilled in the book. Torres was played on his own up front, and with three centre backs for United, and Liverpool’s midfield camped deep inside our own half it was a ridiculous challenge, and one that Benitez should have corrected earlier in the game. United were handing out some rough challenges on the Spaniard, but the referee was clearly offering him no protection. When Ferdinand did eventually clatter him once too often, a free kick was handed to the reds. Torres complained to the ref, we assume along the lines of ‘How many more times.’ Steve Bennett produced a yellow card for the offence. The ‘complaining’ offence. Incensed by this decision Javier Mascherano strolled over to the ref asking ‘Why?’ his team-mate had been booked. Bennett promptly removed his yellow card once more and aimed it in the Argentine’s direction. This was not a day for talking, clearly. We all know what two yellow cards makes, and Mascherano wasn’t going to go quietly. He was incensed and it took Xabi Alonso, and eventually Benitez himself to remind the player that his game was over. 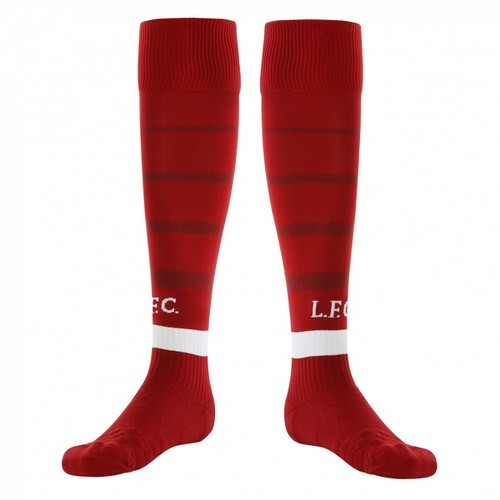 Liverpool limped to half time – looking sorry for themselves and lacking any ideas. In the second half Reina made another couple of fantastic saves to keep the game looking respectable – the reds even had a ten minute spell where they could have grabbed an equaliser. But Reina was not going to stay above the calibre of the rest of the side for long. Ronaldo scored with a header when Reina failed to clear, and Rooney and Nani embarrassed the defence before the latter made it 3-0. Liverpool have been unlucky against United in recent years, no question. Today, they were just uninterested. Liverpool have still only lost 4 times in the league all season. Unfortunately twice against United. Liverpool: Reina, Arbeloa, Carragher, Skrtel, Aurelio, Mascherano, Alonso, Kuyt, Gerrard, Babel (Benayoun 66), Torres (Riise 82).Subs Not Used: Itandje, Hyypia, Crouch. Man Utd: Van der Sar, Brown, Ferdinand, Vidic, Evra, Ronaldo, Scholes, Carrick, Anderson (Tevez 73), Giggs (Nani 73), Rooney. Subs Not Used: Kuszczak, Hargreaves, O’Shea. Goals: Brown 34, Ronaldo 79, Nani 81. Liverpool lost the game before they started, its a phsychological problem. The manager has got to get the win some time in the future and change the bad run we are having. It as a typical game on Sunday, a fortunate goal for ManU and then we struggle, maybe we should bring in Yuri Geller before the next meeting, in Russia! i think evryone is right that referee was out of order all we did was question why ur player was booked!! that red card definatly cost us that match if i think it was gerrard didn’t go and stop the rest from mouthin off at the referee then i think he would have booked all the players was a good match at the begining but we lacked energy towards the end! Very disappointing! I don’t know what it’s like over there in the UK, but down here in Cape Town, Liverpool supporters and Man United supporters live side by side. So to step outside after such a dissapointing result, and for oh so long, is not a very nice feeling at all. I just hope we meet them in the Champions League Final and dish it out to them with a vengence!!! Your report on the game is spot on and our pathetic team and manager and lets not forget the LFC HATER REFEREE has took us our team club and fans down to the depths. Our game against the blue s— is even more important now (how pathetic is that)and nothing but a win will do for me. liverpool were second best against united. Mascherano is an idiot and got what he deserved, where was Stevie G whilst all this happening. The only player that tried to stop M was Alonso. Overall a very poor Liverpool performance with very poor leadership from the captain and the manager. Masch should have been subbed. it was obvious by the way he was mouthing off he was going for an early bath. No wonder West Ham didn’t play him! That red card cost Liverpool the match.